Here are some examples of our top work. These are typical Mediterranean homes. These large doors on the right were 12' tall and 3 1/2" thick, made in Mexico, they were hand carved. They make a statement walking up on them. All of the doors were solid Mahogany, and the Library was done in Black Walnut. The house has everything you could think of, a Library, a Theater, 0 edge pool, and all on the 18th hole of the prestigious Bridges Golf Course, in Rancho Santa Fe,Ca. The house on the left is also on the Bridges Golf Course. It was also a very high end home. With paneled arches through-out, raised panel doors, an Alder Library and French doors at all exits. You get a real feel of prestige in this home, and yet has a very comfortable, relaxed atmosphere. The doors in the middle are in the Pacifica Golf Club, They are 13'6" to the top and are 2 1/4" thick, made of Black walnut they are massive and beautiful. This home has everything in it, a hugh pool, jacuzzi, waterfalls, office, media, everything! 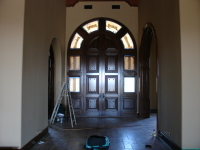 We have installed doors and trim in the most prestigious homes in the county. 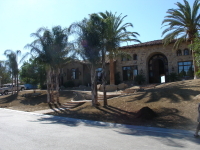 We've done homes in The Bridges, Rancho Santa Fe Farms, Rancho Pacifica, The Meadows, Maderas, Del Mar Country Club, Lago Lindo,and many more.